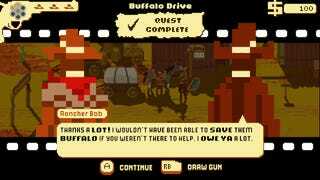 No matter who you kill in Westerado, the story keeps going. Even if you kill a main character. 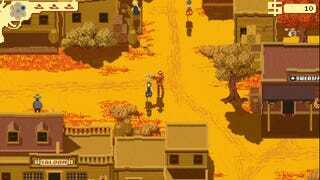 You might have heard of Westerado before. 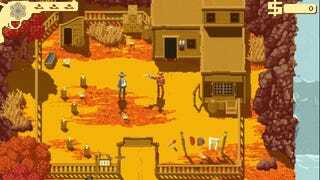 It was released as a browser game on Adult Swim’s website in 2013, but it’s been reworked and enhanced as Westerado: Double Barreled on Steam. 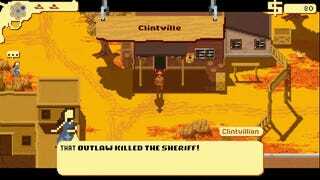 The open world adventure game was recently profiled in our First Five series, and I’ve been cackling to myself while playing through Westerado in my spare time. Let me explain. 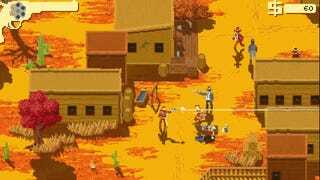 One of the more amazing features of Westerado is how it lets you pull a gun on anyone at any time. I’m serious. It’s even possible (and encouraged) to whip out your gun mid-conversation. There are a couple of reasons you might want to do this. In one quest, for example, you’re tasked with dragging home a wife’s drunken husband. He won’t listen to logic, but when he stares down the bottom of a barrel, he reconsiders and comes with you. Mission accomplished. The whole world reacts to your gun slinging in real-time, but it doesn’t always mean a shootout is going down. You can walk around town with your gun held high and nothing will happen. I mean, everyone else will walk around with a gun out, too, but no bullets are flying...yet. It’s amusing to watch the game world go from peaceful to tense with the click of a button (how did all of those people see you pull a gun?! ), but it can totally impact the way the story plays out. The GIF above is from the opening moments of the game. Both your mother and brother have died, the byproduct of a mysterious stranger who came through and burned your family’s home. Seeking information, revenge, and a quiet place to sleep, you meet up with your nearby uncle. When I loaded up a second save, I decided to start screwing around. What would happen if I pulled a gun on my uncle? You can pull it out, but your uncle shuts the conversation down. Dang. OK, what if I shoot him outside of a conversation? Bingo. He turns into a ghost, and he even gives few a few dollars to go spend on idle gambling. I decided to start pushing the limits on this. It makes sense they’d find a way to keep the uncle around, since he’s a critical NPC early in the game, but what about the first sheriff you come across? He provided details on my family’s killer in another save game, but could I kill him, too? This, of course, lead to a shoot out in the town square. People may not have respected the sheriff very much, but they don’t appreciate a stranger walking in and putting a gun to his head, either. I’m usually disappointed by how much games allow you to mess with the world, characters, and systems they’ve set up. They have a story they want you to experience, and they’ll break the rules to make sure it stays that way. It’s understandable. 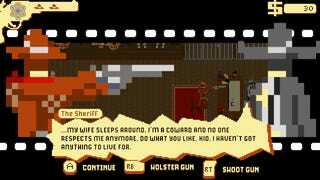 I don’t expect every game to let me whip out a pistol and kill a major NPC, but I appreciate that Westerado says “hey, go for it” because it’s actually built into the game design. You can kill everyone and still beat the game. 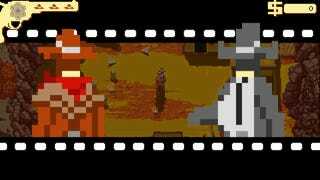 If you’d like to watch me play a lil’ Westerado, you can do so over here.